Our arrival at Bundaberg was just as we had predicted - just after sunrise on the 9th of November we steamed up the Burnett River to the Bundaberg Port Marina. There were several other boats waiting to clear Customs, Immigration and BioSecurity so we waited, not too patiently, for our turn. As the marina had hosted the Port-to-Port Rally (a rally for cruising boats coming from Vanuatu or New Caledonia) there were few slips left. Lucky for us our good friends on Dilligaf, Bill and Sue Teasdale, acted on our behalf and pestered the marina staff to get us a slip near them. It makes life much easier to have a berth in a marina after a long passage. We didn't waste any time in getting back into marina-mode. 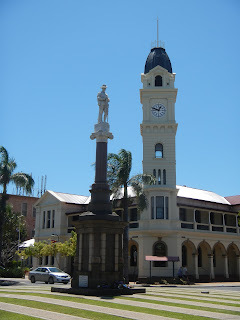 The following day we took the shuttle bus the 20 kilometers into Bundaberg and got phone and internet connections. Bundaberg reminds me of any small town in the midwest - largely surrounded by big farms (mostly sugar cane), the town has little industry that makes it unique other than the three sugar mills and the Bundaberg Distillery which makes Bundaberg Rum. I have to admit it was kind of shocking when we stepped into the shopping mall - I knew that we weren't in Vanuatu anymore. Expensive merchandize spilling out from the stores and crowds of people doing their Christmas shopping. Without wasting any time, we spent more money that we should have. We had lunch at one of the bakeries, which are similar to the ones we found in New Zealand. They offer a wide selection of individual pies, mostly filled with meat or eggs and cheese. I chose one filled with camel meat, which I had never eaten before. There was no difference between that and beef, as far as I could tell. That night the rally sponsors hosted a barbeque. In a large meadow just across the street from the marina, we could see kangaroos grazing so Ruthie and I walked over there and watched them for a while. There was no irony lost on us as we returned to the barbeque and ate - guess what? Kangaroo meat! We rented a car to run some errands and I was hoping that I could play the part of Mel Gibson in Mad Max. Alas, I was driving an old beat up Camry instead of a super-charged muscle car and wearing a t-shirt and flip-flops instead of heavy boots and thick leathers. Also, the coast here is nothing like the Australian outback and I don't look like Mel Gibson. Well, maybe I do a little bit . . . The days of boat projects (mostly cleaning) passed quickly amongst our discussions of where we go next. The Bundaberg Port Marina is hardly a place anyone would want to stay as it's kind of stuck out in the middle of nowhere. On Thursday, Corie left with Mark on Merkava in search of surf and more interesting points south. We sent our anchor and chain in to be re-galvanized so we're stuck until it gets back. Tonight is the final rally event, a Big Dinner for all participants and it should be interesting as there's some intense thunderstorms brewing. The Australians we've met have been very friendly even though they talk funny and drive on the wrong side of the road. People give the impression that they're interested in us and our travels which is flattering. On more than one occasion people have gone out of their way to help. It will be interesting to see if that attitude changes as we migrate to the larger towns and cities. Weather permitting, we should leave here sometime next week.